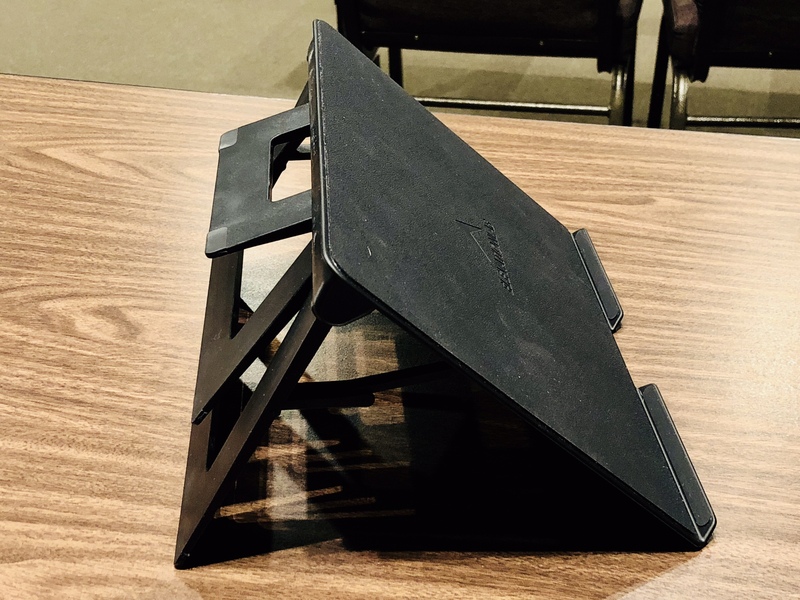 While there are some high quality tablet stands out there, the vast majority tend to be geared toward just two use cases: either media consumption, holding the tablet for use with a keyboard, or some mix of the two. However, these aren’t the only use cases that involve a stand holding an iPad. 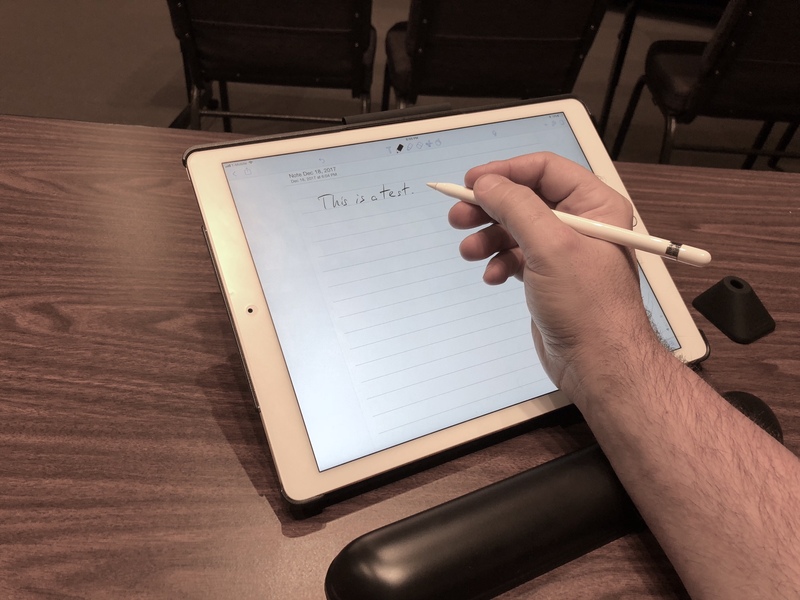 Using the iPad as a digital notepad for digital ink is nothing new, but what was a once a niche activity due to the expense and difficulty of use associated with older capacitive styli is now more mainstream and user friendly thanks to the release of the Apple Pencil two years ago. The Pencil is no bargain, but it delivers a user experience that only the most expensive pressure sensitive Bluetooth connected styli can come close to. The low latency, high sensing speed, accurate pressure sensitivity, and good battery life combine to make the Apple Pencil feel like a real-world writing and drawing tool. Its capabilities opened the door to a more professional drawing and design experience on the iPad, and developers quickly followed suit with apps to take advantage. The pairing of the iPad Pencil and these apps make the iPad Pro a serious art, design, and note taking tool, capable of serious professional work. What we lacked after the release of the Pencil was a stand specifically designed to hold the iPad Pro while drawing with a tool like the Apple Pencil. Again, most stands are not designed with the user putting pressure on the screen in mind. Also, while holding an iPad Pro between 45 to 90 degrees is perfect for viewing, somewhere between 0 and 45 degrees is usually going to be better for drawing applications. When you add these two conditions together, you get another problem. A tablet stand with a movable hinge is not going to have the same level of stability throughout its range of motion. A hinge that works well at 45 degrees won’t be very stable close to 0. This isn’t a problem when you are just using a stand to prop up a tablet to watch Netflix, but it’s a whole different kind of discussion when you are going to rest your wrist on it while working. The simplest solution to a problem is almost always the best one, and the DraftTable from ElevationLab is a great example of this principle. 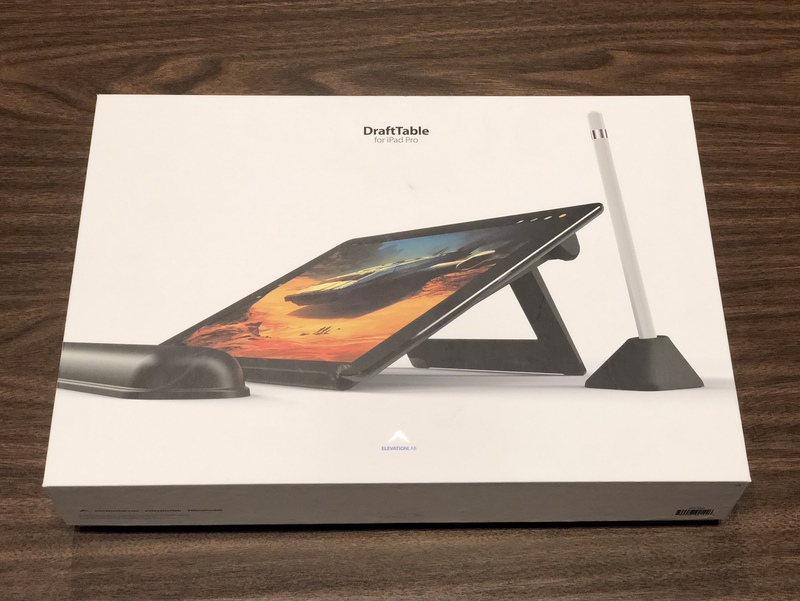 It is a near-perfect package that combines simple solutions and elegant design to delivers a best-in-class experience for drawing on an iPad Pro. 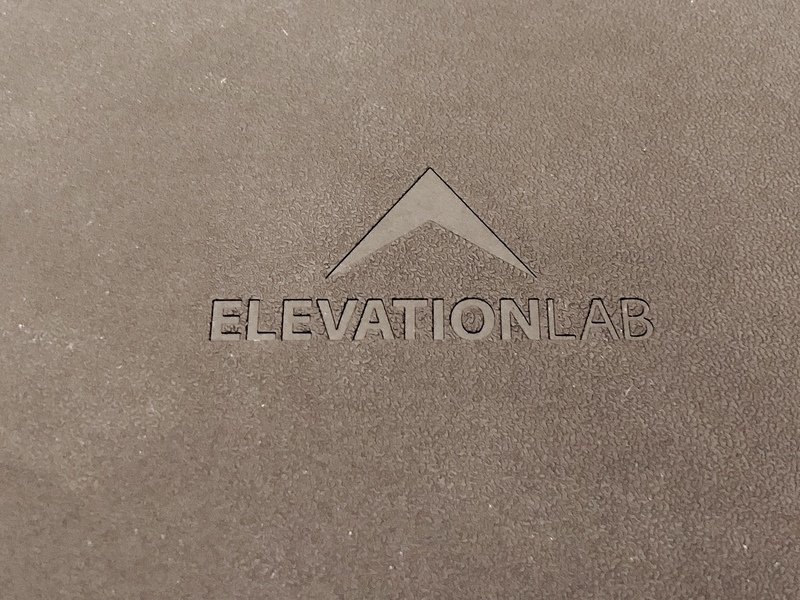 First off, to solve the problem of holding up to user putting weight on it, ElevationLabs built the DraftTable like a tank. I am not exaggerating here. It is absolutely rock solid. The table surface has all metal construction, and it isn’t a single thin sheet of lightweight aluminum, either. You can get an idea of the thickness of the metal from the photo above. The DraftTable weighs a full 2.1 pounds, and you will know it as soon as you pick it up. While this may not make the DraftTable the ideal travel partner in all cases, I can assure you of one thing- It won’t be sliding around or giving way when you are writing on it. This accessory is built to be stable during use and built to last. 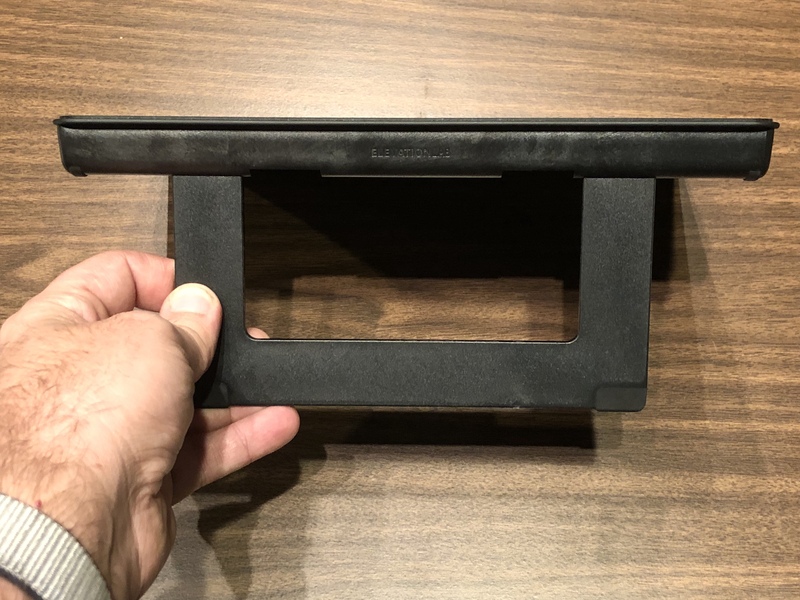 Next up on the list of simple solutions are the tandem issues of holding the iPad Pro at the right working angle, and the ability of a single hinge to be stable across its full range of motion. ElevationLabs’ simple solution to this problem was to think out of the box and throw the typical design with a single support or set of legs on a single hinge out the window. Instead of one support, the DraftTable has three that share an interlocking hinge, each with its own angle of use. This is a really well thought-out design. Each set of legs is spring loaded, so they stay in place once folded, either in or out. Each also has enough thickness to provide plenty of stability at its set angle. This isn’t like other stands that wobble or move when you touch your iPad. The DraftTable stays still during use. In a really smart design touch, ElevationLab also turned the interlocking hinge for the three separate legs into another support for the table. This creates a fourth, almost flat working position for your tablet when all the support legs are folded up. Between these four positions, users should be able to find one that they are comfortable working in. It’s the little details that set great hardware apart from good, and I see those kinds of details with the DraftTable. Each of the legs has rubberized feet at the corners to keep the stand from sliding around when you have your hand resting against it. The bottom edge of the DraftTable also has two large sections of the same rubberized material to keep the base from slipping. 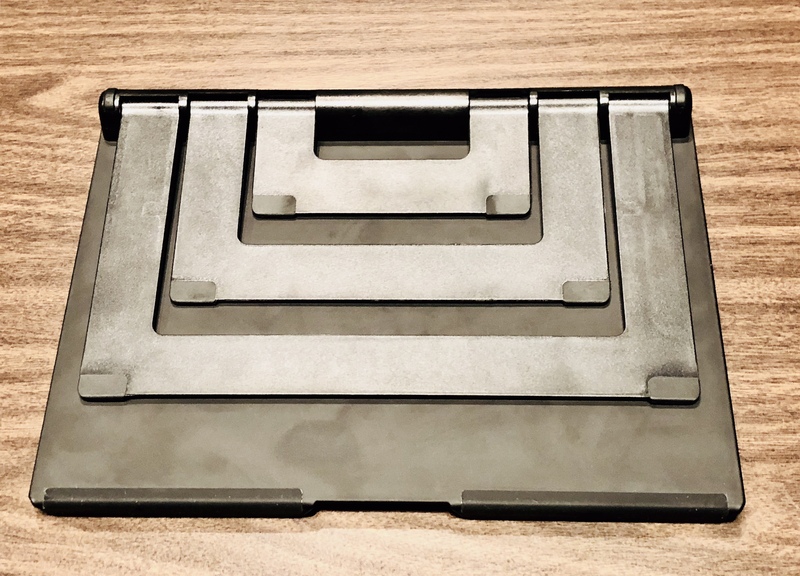 Between the feet, the base and the combined weight of the DraftTable and your tablet, it should hold its position on any surface. The surface of the DraftTable is also covered with a similar, but more textured rubberized material. This material adds friction and should help to keep your iPad from moving around while on the stand. As an example, I use a Logitech Slim Combo case and keep at least the rear section of it on pretty much at all times. It has a fairly smooth plastic back, which would make it a risk for slippage if the DraftTable’s surface was uncovered metal. Thanks to the material on the DraftTable, my iPad stays rock steady, even with this case on it. Another plus is that the DraftTable is quite versatile when it comes to device compatibility. 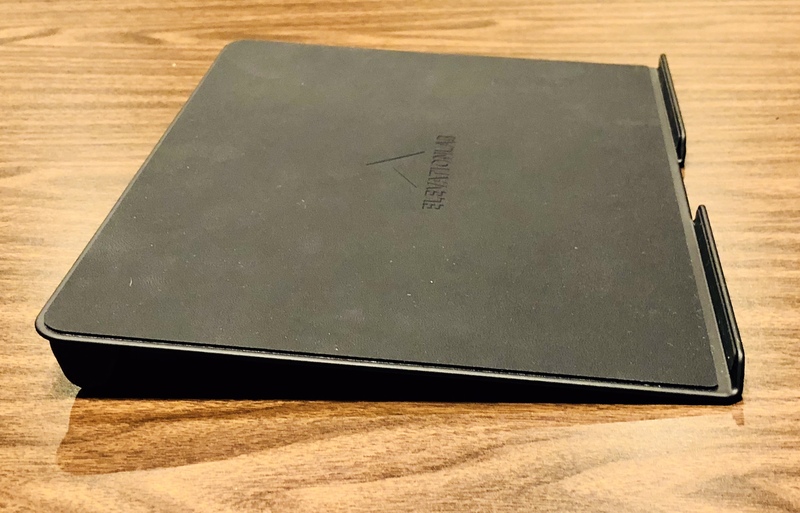 While it is designed with the iPad Pro in mind, it is capable of holding any model of iPad and should also handle most other tablets, as well. I also appreciate that the table and lip at the bottom are big enough to accommodate my 12.9″ iPad Pro with the back section of my aforementioned Logitech Slim Combo case installed. Since I keep this case on pretty much all the time, I like that I can use the DraftTable without having to remove it. 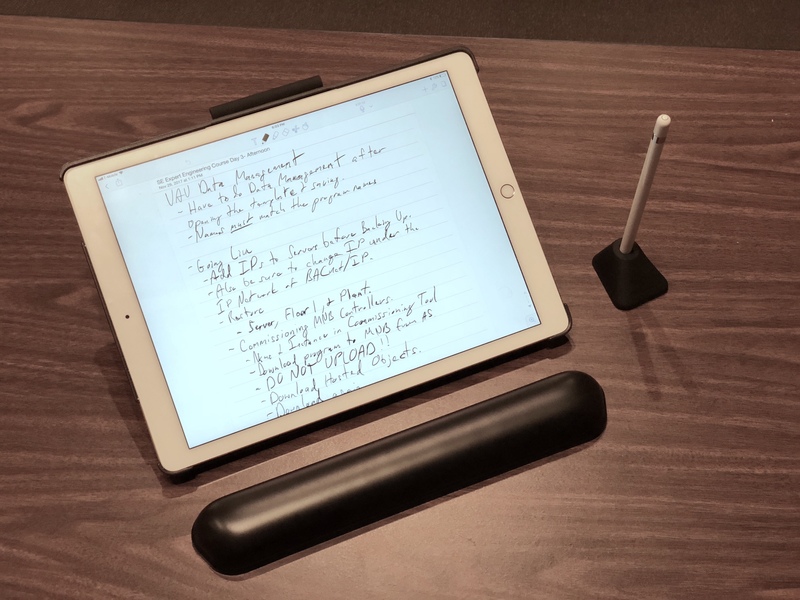 The DraftTable is available alone, or in a Pro Kit, which includes a wrist rest and Apple Pencil holder. It may not seem like they would add that much to the equation, but these two items share the DraftTable’s simple and practical design. ElevationLab’s PencilHolder is incredibly simple, but its strength lies in the fact that it doesn’t move around and it won’t tip over easily. It has a wide base that lends stability, and the bottom has ElevationLab’s NanoPad material, which grips the surface below it. I personally found the ArmRest to be more even more useful and versatile. The exterior material is silky smooth, it stays cool, and feels really nice on the arm or wrist. It feels like a premium product and is definitely a good fit alongside the DraftTable. Also, it is wide enough to use with just about any keyboard or laptop, so it is quite versatile in its own right. These two accessories only cost $20 to add, and in my opinion, they are definitely worth that when compared to similar products. At the end of the day, if you do a lot of drawing or note taking with your iPad, the DraftTable is the gold standard for holding it while you work. I haven’t seen anything remotely close to this product for this kind of task in terms of quality and design. Frankly, this thing is lapping the field. It is that good. I really appreciate ElevationLab’s laser focus on building the perfect accessory for the task of drawing on the iPad. However, I’m not surprised by it. I see the same kind of attention to detail in the DraftTable that I noticed in my recent review of their BatteryPro. It’s the combination of overall quality and design and those little details and touches that really make both products stand out. You can see and feel how much thought and effort went into both the DraftTable and the BatteryPro. I knew ElevationLab by reputation before these two reviews, but now I can wholeheartedly recommend them as an accessory maker of the highest order. The DraftTable is available from ElevationLab for $49.95. The DraftTable Pro Set, which includes an ArmRest and PencilStand, is available for $69.95. Wow – spend extra $ and carry around an accessory, in order to to get the same functionality that a Surface Pro gives you natively. Forgive me if I don’t swoon. The Surface’s Kickstand feels like a child’s toy next to the DraftTable. There is really no comparison between the two. I understand that a lot of people love the Surface. I am not one of them, and I am a lifetime Windows user on desktop/laptop. I know this is a personal preference thing, but I’ll take my iPad Pro, keyboard case, Pencil, and an OS that isn’t hindered by legacy and is built around touch. I have a touchscreen Windows laptop for work, and touch is just a bolted on kludge in Win 10.